OK, so I had to Wiki Maxwell’s equations and now my brain hurts! And what’s happened to the children? sorry about the brain. The joke is just that in Invisibulia the laws of light are only approximate. So the equation is only “approximately equal” — that’s the squiggly equals sign. If it makes you feel better, I don’t understand Maxwell’s equations either, but I do know what “equals” means. Notice how the joke got even weaker when I tried to explain it? I got fed up drawing the children. They are probably playing hide and seek somewhere. 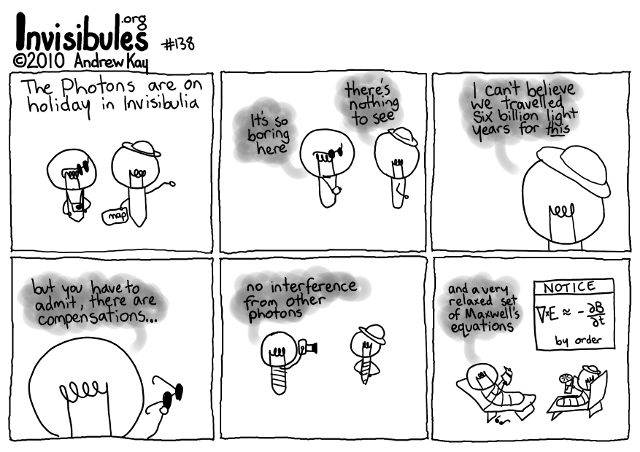 Wait, you think photons have children? Well, what do you think would happen if you brought two photons together, with enough enthusiasm (err, energy). I feel better now that I know you don’t understand it any better than I did! (I did know that the squiggly equals means approximate, but you weren’t to know that). If photons don’t have children, then are you suggesting that there are mini photons? Maybe they are emitted by dwarf stars. are you suggesting that there are mini photons? Maybe they are emitted by dwarf stars.